My classes aren’t meeting at all today, thanks to the “weather bomb” we are currently enjoying. It is uncanny how many storms have come through on Wednesdays this winter! And it’s an unpleasant surprise to get a big one this late in the term. The bright side seems to be that it’s supposed to warm up significantly by the weekend, so we can hope that all this snow will just be a bad memory before too long. I have a nineteen-year old daughter who is going through a sort of soak of depression . . . which a friend of mine suspects is brought about by such offerings as your Great Minds of the WIW, not just your particular October ad, of course, but a long accumulation of shaded brown print and noble brows, reproduced year after year, all of it pressing down insidiously and expressing a callous lack of curiosity about great women’s minds, a complete unawareness, in fact. . . . I realize I cannot influence your advertising policy. My only hope is that my daughter, her name is Norah, will not pick up a copy of this magazine, read this page, and understand, as I have for the first time, how casually and completely she is shut out of the universe. I have two other daughters too — Christine, Natalie — and I worry about them both. All the time. Bean counting is tiring, and tiresome, but your voice, Mr. Valkner, and your platform … carry great authority. You certainly understand that the women who fall even casually under your influence (mea culpa) are made to serve an apprenticeship in self-denigration. It happens that I am the mother of a nineteen-year-old daughter who has been driven from the world by the suggestion that she is doomed to miniaturism. Her strategy is self-sacrifice. In Women & Detective Fiction, this week’s reading also raises questions about literary canons and standards, and how we decide what is worth reading and discussing, but in this case it does so more accidentally. I’m not someone who believes that we should assign only the books we believe to be The Greatest (even if we individually felt we could be confident about our standards). Universities are in the business of education, not adulation, and plenty of works that we might feel falter on some grounds are plenty interesting and significant (historically, theoretically, formally) on others. Courses vary in their purposes, too, and the best and most relevant conversations don’t always emerge from the most elegantly crafted narratives. 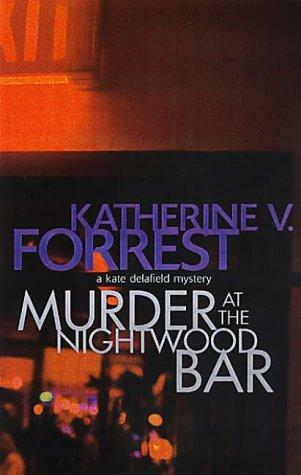 Still, I do sometimes find my principles conflicting with my actual reading experience, and that’s how I’ve felt with Katherine V. Forrest’s Murder at the Nightwood Bar, which has been our class’s reading for the past week. Murder at the Nightwood Bar is one in a series with inarguable significance (“First, first, first,” emphasizes Victoria Brownworth in her recent profile of Forrest), and it deals explicitly with questions of sexual identity and systemic discrimination both through its closeted detective (alienated, thus, both from her follow officers and from the lesbian community she engages with during the investigation) and through the crime itself. It sets up lots of good points of comparison with our other books, from the detective’s struggle over getting too personally involved with the case (or people involved in it) to the connections it makes between individual crimes and systemic injustices. As far as all that goes, I have no regrets about having added it to the syllabus this year. I just wish it were better written — yes, that awkward evaluative measure! Better at what, to what ends, as I’m always asking? In this case, I just mean “better at the words”: especially during the patient rereadings required for class prep, it has seemed stilted and inartistic, sometimes tediously so. I’ve felt no temptation to discuss anything that’s not literal about it: not its form or its style, not its voice, its attention to setting, none of those “literary” aspects. Mind you, it’s not the first of our readings to make that kind of reading seem beside the point: Agatha Christie is also not particularly literary. But Christie’s prose has a clarity and economy that gives it its own (superficial?) elegance. That said, while Forrest may not be as good a stylist, her materials are more challenging — her agenda is more ambitious, and she gave us much more to talk about than Christie did, even though Christie is, of the two of them, the one who is obviously part of the ‘canon’ of detective fiction. Not every course can or should be a tour of “the best that has been thought and said” (as if we could be sure what those examples are — as Woolf says, “where books are concerned, it is notoriously difficult to fix labels of merit in such a way that they do not come off”). My goal is always to find the readings that are the best for my purposes, which in this case include considering a wide range of different examples of detective fiction by women as well as examples that are in fruitful conversation with each other when collected on the syllabus. My hope is that they will also reward close reading and rereading. At this point, then, I’m ambivalent about Murder at the Nightwood Bar, then, which certainly serves the first purpose but doesn’t quite fulfill my hopes for the second. Those interested in the question of first, first, first might do well to read any crime novel by Maria Lang, who originated the Scandinavian detective novel after World War II. The lesbian elements are startlingly present, at a time when almost nobody was “out” including, I believe, the author herself. Fascinating, Jeffry: I had never heard of her! I wonder how many of her books would have been available in English translations before Forrest’s books appeared – or are now, for that matter. I see just a couple of titles available on Amazon. The Stone Diaries is the only thing I’ve read by Shields, but it’s a beautiful novel. I don’t know why I haven’t read more of her books. About Christie: she might not be “literary,” but many of her books contain long digressive passages having nothing to do with the story, where AC discusses (sometimes in very fine and even beautiful language) whatever subjects have caught her interest at the time. The travel writing in the books set in Egypt, for example, or the passages about gardens in–I think–Halloween Party. Some excellent stuff there. I’m always disappointed when I read one of her books and don’t come across such a digression. Scott, you remind me that I have read very few of her actual novels: for this class we read only short stories, and besides Murder at the Vicarage and The Murder of Roger Ackroyd I haven’t read a full-length one in ages. I should do that before I generalize any more about her! Well, I realize that I’m generalizing. Christie wrote what? 70 or more novels? I’ve read a dozen Poirot books, or maybe a few more than that, but hardly a representative sampling of her work, probably. I read Shields’ Stone Diary a loooong time ago and really liked it but have never felt compelled to pick up any of her other books. You make Unless sound really interesting though so I just might get to it one of these days. I am not much of a mystery reader but the Forrest book is actually one I have read. I agree with you, the story has lots to think about but the writing is not very good. As you can tell, I really do like Unless, although it grew on me rather than grabbing me immediately. I think that as I have gotten older I have more sympathy for some of the problems the narrator is dealing with, for one thing, and I’ve also spent more time thinking about the kinds of issues that make the connections with Woolf so stimulating. I also like her The Republic of Love, which I don’t think is generally considered one of her best; my appreciation of Unless is motivating me to reread The Stone Diaries, which I haven’t read in many years. ‘Unless’ is the only book of Shield’s that I have still to read. It was on one of our book group lists just after it came out but it was also just after my mother had died and somehow I couldn’t bring myself to read it then. The only time I’ve actually opted out of the chosen novel. And then, of course other things came a long and I’d completely forgotten that it was sitting there on the shelf. I think I might assign it to one of the other book groups just to make sure that I have time to fit it into my reading schedule. If you read it, I’ll be very interested in your response. It’s not at all a difficult read: it’s deceptively easy, in fact.